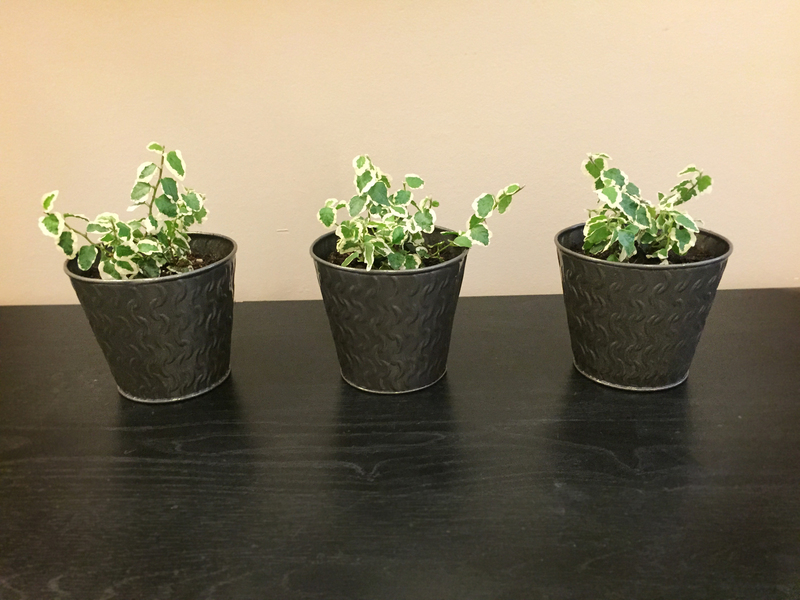 These cute planters were given a quick and easy facelift from the image below! This is a super easy project that can be completed an a few hours if you have everything on hand. I will also be going through some tips for potting indoor plants and how to actually keep them alive long term. 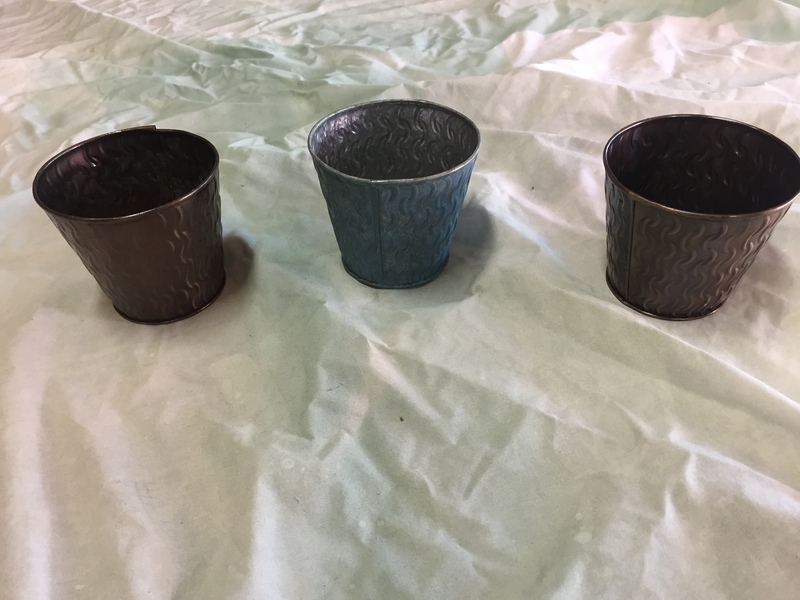 I found these metal planters at Goodwill for a total of $1.50. Thanks right, 50 cents each!! AKA: Right up my frugal alley! I was surprised that I found three with the same pattern, even though one’s blue and two are brown. This picture was taken after I gave them a good scrub….they were so dirty, I swear a plant could have still grown in the amount of dirt left inside them. 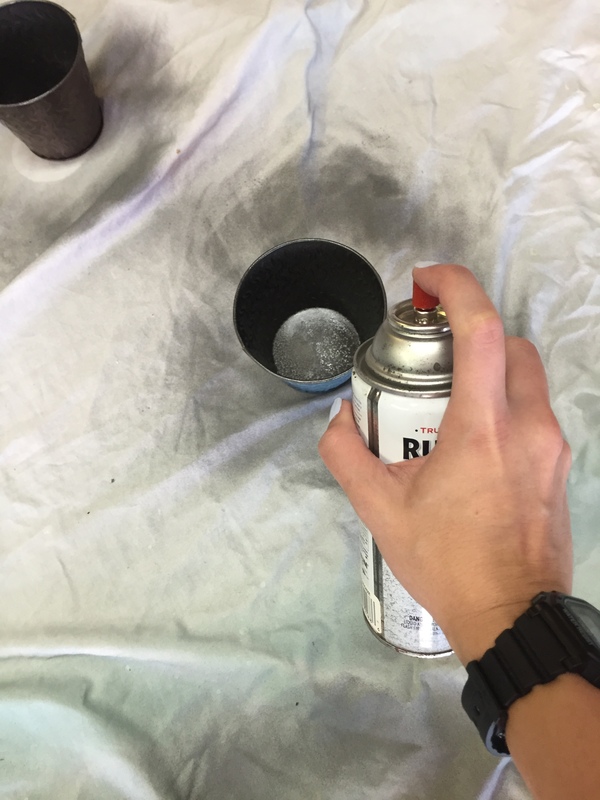 After your pots are clean and dry, it time for some paint! I used a “Hammered Gun Metal” color. This particular pray paint is good for stopping rust and fantastic for metal objects. And fortunately it was in my dad’s supply of paints! You might be getting the idea that my had has everything in his garage. And yes…yes, he really does. I had to help him go through all of it when my family moved a few years ago….It was the longest process I’ve ever been through. But surprisingly enough, he actually knows where everything is. There’s method to his chaos. 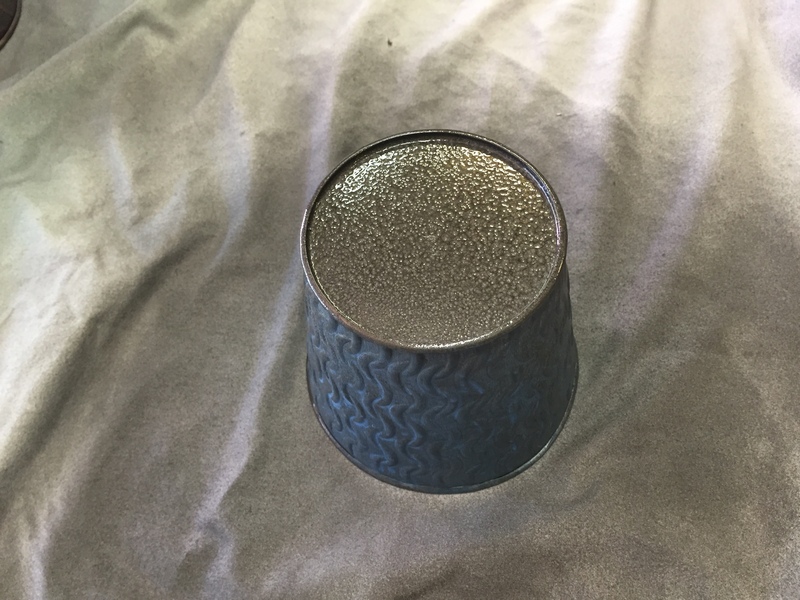 With your spray paint ready, paint the inside rim of the pots. We don’t want to go all the way inside, because I’m not sure how the plants will like (or dislike) the chemicals in the paint. The dirt will cover the places that aren’t painted. NOTE: always keep the can moving when spraying. 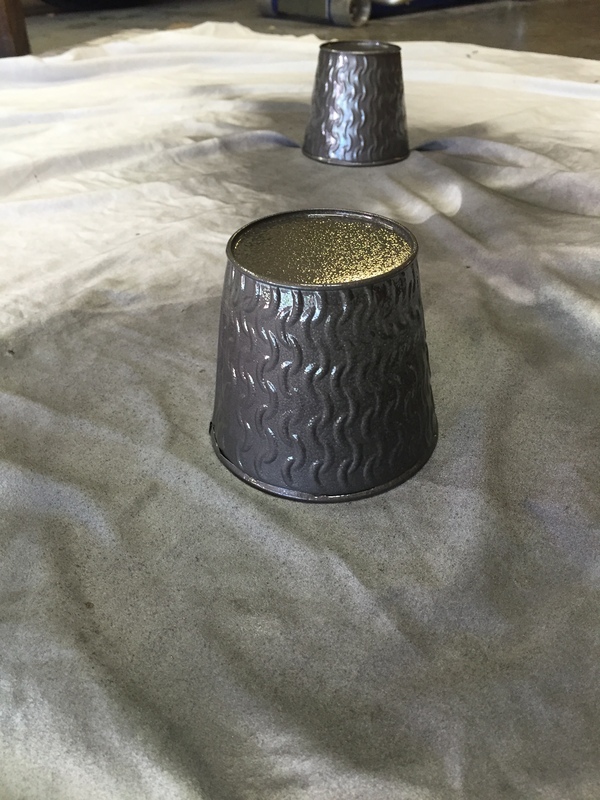 Once the rim is completely dry, flip the cans over to paint the bottom and the sides. Make sure to do two coats of paint on the entire surface. (Except for most of the inside, like stated above.) This spray paint seems to take a bit longer to dry than others I’ve worked with. Perhaps that’s due to the metal flake in the paint? You’ll need to wait a minimum of 30 minuets between coats. Plants need to have a hole in the bottom of the pot they live in. This allows for proper drainage of excess water. Without this, they can become waterlogged and die. BUT there is a way around this. 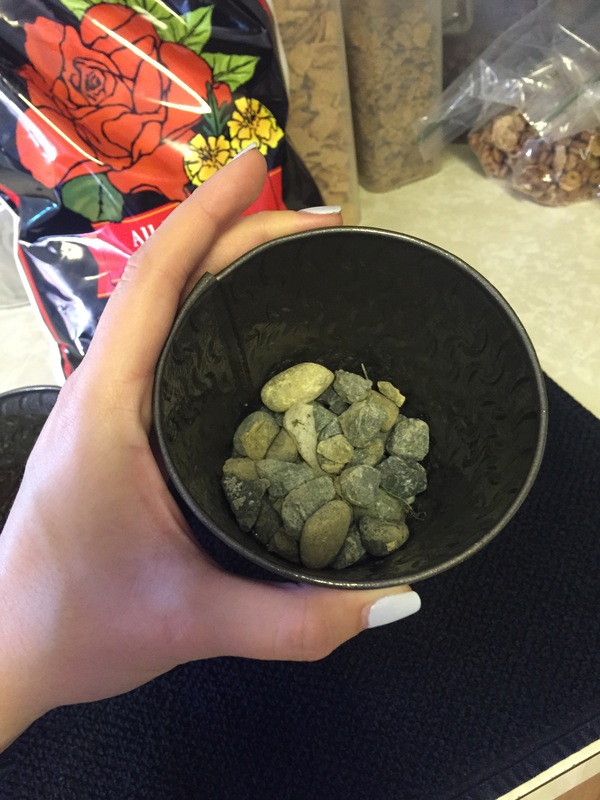 Fill the bottom of your pot with an inch and a half of rocks or gravel. If you plant gets too much water, it will collect in the bottom instead of keeping the soil saturated. And the roots can then take the water from the bottom when they need it. I also recommend using potting soil bought from a store. WHAT?!?!?! Ms. Frugal paying money for dirt?!?! ….yesss. Bagged soil insures ultimate richness and the absents of bugs or mold. And I only paid $2.99 for a small bag, with more than half left over for more plants. I simply can’t let my frugal ways be the death of these plants. Always read and follow the directions provided with the plant. It will tell you how much sunlight and water it needs. Most plants actually like the soil to become a bit dry before you water them again. Plants cannot survive on water alone. Much like us, they need food! Using a fertilizer every two weeks to once a month can do a lot for your plants. It can literally be life or death for your plants. There’s only so many nutrients in the soil you’ve provided for it. Once they’ve consumed it all…its gone. Until you add more! 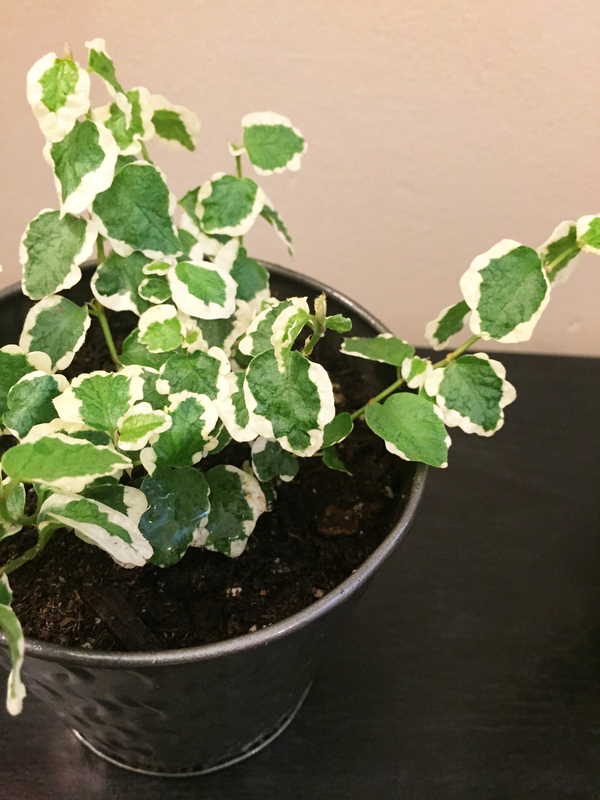 Clean your plant once a month. Build up of dust can hinder it’s ability to absorb nutrients. Just wipe the leaves with a damp cloth. And of course, make sure that cloth is clean. Ruff up the soil a bit every once in a while. We don’t want the soil to become to compact. The roots need to breathe as well. And last but not least, rotate your plant; It will grow toward sunlight. So, rotating it every once in a while will encourage more growth toward the light. And there you have it, a simple facelift for some planters that would have otherwise gone unloved. 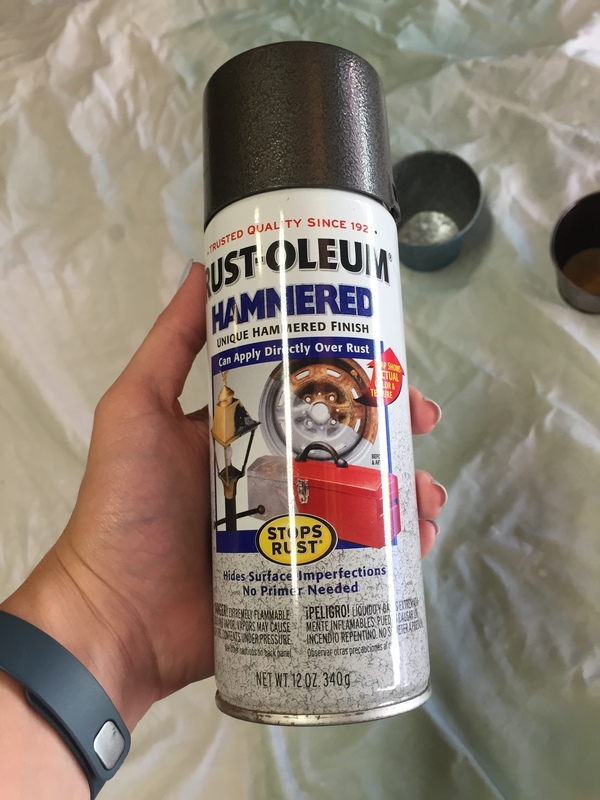 Let me know if you try this easy project!